It's my first time working on pixel graphics, so the art style formed quite naturally, it sort of just became that way. My background is in animation, so that helps too! These screen caps are quite old, and there is more stuff in the storage. Miskatonic University is keeping me occupied currently, as it's a big block in the game. Short answer is that I don't know yet! This started as a hobby project, but is much more serious work now. And I still want to continue without any limits or deadlines. Publishing the game is something that I have no experience on. I have some plans/hopes but nothing concrete yet. So the answer is maybe! There is also a little query in exams that checks if you remember what you have read, so that affects the grades too. Hopefully Walter will have a photographic memory or at least have that option. Maybe some sort of mechanic where Walter can do all the remembering for you and then he'll know what the correct answers are on the test? Having read the original story am I correct in assuming that it is possible to get killed? Will there be a way to defeat the witch without getting killed by her familiar at the end? When you study for a test, Walter will read aloud the answers. Then when you take a test, it's a multiple choice query, and if you have studied enough, the right answer (which Walter had read aloud before) will be available. But this system is not ready yet, so there might be some changes too. Main thing is that it requires some interaction, and is a small puzzle in itself. It's been a while since I posted last time, so here's an update! As you might have guessed, that is the main menu, the starting screen. I'll tweak it more later on, but it will do for now. Maybe the buttons need bit more polish/sparkle... Suggestions and other comments are very welcome! 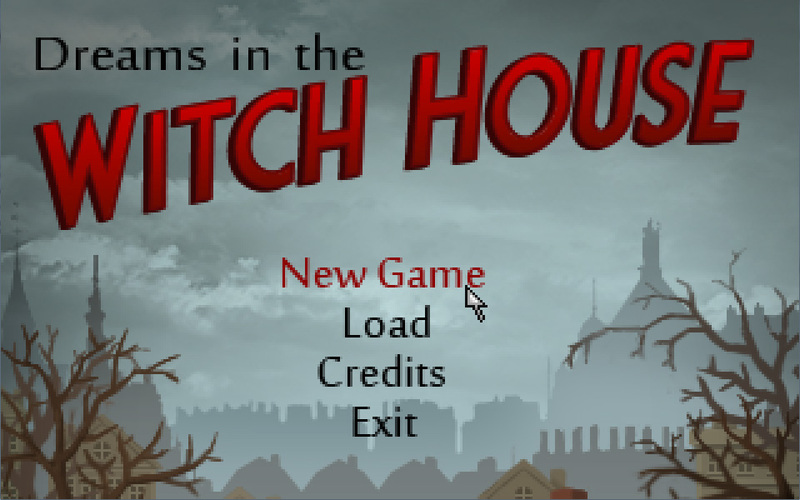 I played around with the Smooth Scroll module, and was able to do a nice parallax tilt to the Witch House. You'll see it a bit later, when I have time to do my first video. As the Halloween approaches, I'll be posting more stuff, and this time it's the scary, evil stuff. You might get a glimpse of Brown Jenkin, or even Keziah! The way "WITCH HOUSE" is written makes me think of old cartoons somehow. The rest is absolutely fine. Great background image. The way "WITCH HOUSE" is written makes me think of old cartoons somehow. Yes, I was thinking that the "house" is almost like "mouse", so it might remind of old Mickey Mouse posters . But really I was trying to get old, pulpy horror movie poster feeling to it. I agree, the background is amazing! I like the Witch House font, maybe you can try toning down the red slightly, but other than that I think it looks great! Something strange is happening in the Witch House. It must be a dream, right? Looks great, as have all your screenshots so far! I'm not familiar with Lovecraft but the game has intrigued me. The light RPG systems sound really novel. Lovecraft inspires so many adventure games! I dig your style. The animations look neat too. Thanks! I hope that the game will be totally enjoyable to people who don't know anything about Lovecraft. This story is quite different than the usual "Cthulhu Mythos" stories. It's more concentrated on the main character, and you don't have to know anything about the Old Ones etc. Still Lovecraft fans will get an extra kick out of it, I hope. The Lite RPG-system/open world mechanism was something I wanted to try and I feel it fits the story well. The problem is that it takes a lot of time to make it all work, and possibility of bugs goes way up. Also, I want that the game has a good replay value (Walter might die half-way through the game! ), so the puzzles should have some variation each time. Good thing is that I have learned a lot scripting doing this. The code is a bit messy, but it's slowly getting better. Just learned about floating point numbers yesterday! Maybe the community could advice me a bit... I'm thinking about changing the resolution of the game. It's currently 320 x 200, so if people will play it fullscreen with 16:9 monitors, there will be black borders, or an ugly stretch effect. I kind of just noticed that when I upgraded AGS to 3.4.0.16 version, I could use 320 x 180 resolution which would fill the screen nicely and pixel perfect. Of course making that kind of change seems a bit daunting. But I feel it's easier to design rooms and graphics for 16:9 aspect ratio. The inventory is hidden normally so I have the full screen height to use anyway. Gui's have to be re-designed, but that's not that big of a problem, because I haven't really worked on those. Bigger problem is if I crop my backgrounds, I'll lose my hotspots, walkbehinds etc. But is there something else I should consider, something that might cause bigger problems? Currently I feel that the extra work would be worth it. 20 pixels doesn't seem like much but at this low res it's quite a lot going missing. I can't speak for others but I play AGS games in a window, mostly 2x or 3x scale. Thanks for the input! Yes, every pixel counts. Somehow I feel that playing the game on full screen feels more like playing "real" game. Those black borders might raise questions to casual gamer. I made some test with 320 x 180 px, the backgrounds didn't suffer that much, 10 pixels off from top and bottom. And those parts usually haven't got anything important going on. I enjoy that I can have full screen mode and there isn't any stretching going on. I still have to think about it, like you said, quite a lot pixels would be lost, and more work with the background tweaking. The "casual gamer" won't go for low res games even if they come in the right aspect ratio. Wadjet Eye games have a small but dedicated player base who like the graphics as they are, and the Steam forums for said games get the occasional "this looks like crap" threads by people who wouldn't buy them anyway.